Die Europ. Turkei: Croatien Herzegovina, Serbien, Bosnien und das land der Montenegriner. 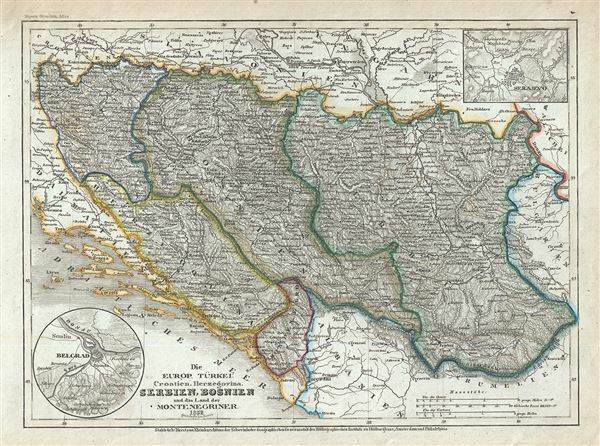 This is a scarce 1852 Joseph Meyer map of the Balkan region in Europe. This map, made when the Ottoman Empire controlled much of the region, covers the modern day nations of Croatia, Serbia, Bosnia and Herzegovina and Montenegro. Throughout, major towns, cities, rivers, mountains and other topographical features are noted. An inset in the upper right quadrant features Sarajevo, while another inset in the lower left quadrant details Belgrade. This map depicts the waning years of Ottoman hegemony in the region. While Greece was free of the Ottomans after the Greek War of Independence in 1832, the other Grecian and Balkan states, including Serbia, Croatia, Moldavia, Wallachia, Albania, and Macedonia, remained at least nominally under Ottoman control until 1878. > This map was issued in Meyer's Zeitung Atlas. Although all the maps in this atlas are not individually dated, the title page and maps were often updated while the imprint with the date was not, causing confusion to the exact date for some of the maps. Moreover some maps in the atlas were taped in at a later date as an update to the atlas. We have dated the maps in this collection to the best of our ability.